[JUNE 14, 2000] Their project has a first name. It’s O-S-C-A-R. Their project has a second name. It’s M-A-Y-E-R. 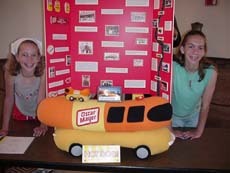 Even though most of us think of the Oscar Mayer name as a familiar brand of hot dogs and bologna, Zion Lutheran School students Kelsey and Kaylee Carnahan now know the entire story behind this diverse company based in Chicago. Their project was one of the seven from Zion Lutheran School in Lincoln that earned the highest rating possible at the State History Fair in Springfield. This unique history fair project required the Carnahan sisters to do some 50-plus hours of research and work outside of class. 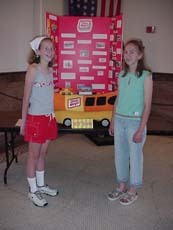 By using books and information from the Kraft Foods and Oscar Mayer Web sites, Kelsey and Kaylee were able to document the history of the company and trace the evolution of the Wiener Mobile promotional vehicle. They incorporated actual product labels into their project and even obtained a stuffed Wiener Mobile from a Bloomington grocery store to accent their display. This week, visitors to the Logan County Courthouse will be able to view the stuffed Wiener Mobile alongside displays on Bethel Church, Elkhart Hill, Wrigley Field and the Trail of Tears. Participation in the State History Fair is the culmination of a yearlong project assigned by Zion Lutheran School teacher Steve Schumacher. Early in the fall, Schumacher assigns the project and suggests possible project topics that deal with some phase of Illinois history. As the school year progresses, students rack up library hours researching their topics. And, even though the emergence of the Internet offers easy access to information at one’s fingertips, Web sites can be used only as secondary sources of information. All work on the project is completed outside of class. Most students spent about 50 hours researching and constructing the projects. Schumacher explained that the projects might take one of several forms. The students may choose to construct a visual display of their research, write a research paper or even dramatically interpret an event from history. The first competition was a school-wide history fair. Forty projects from Zion were then sent to a regional history fair in Macomb. Fourteen projects from Zion School were awarded superior rankings in Macomb and were chosen to compete in the State History Fair in Springfield. "Having 14 projects qualify for state competition with 600 total entries really says a lot for our little school," boasts Schumacher. At all stages of the competition, students are evaluated by a pool of professional and novice judges on their creativity, completeness of historical research and presentation. Eighth grader Jennifer Methling chose to document the famous people who lived on and around Elkhart Hill. She actually created a replica of the hill from moss-covered Styrofoam to accompany her collection of biographies and pictures from the Elkhart cemetery. Zion student Lynne Davidson earned a very special award at the state competition. Lynne conducted an in-depth interview with her neighbor, who was a World War II veteran. She was recognized a exhibiting the best World War II project and received a U.S. savings bond and a set of books on World War II. Next school year, Zion students will be assigned to create projects for the Illinois state science fair competition. What unique projects will they pursue then? Perhaps a taste test of the world-famous Oscar Mayer hot dog will be one of the top projects at the fair.